When trader Mark Baum visits a credit analyst to find out why the housing bonds he bet against haven’t been downgraded despite their obvious flaws, he’s told bluntly that it would be bad for business to downgrade such massively successful financial instruments. He accuses the analyst of blatant self-interest, and she points out that it’s in his self interest for it to be downgraded. Unfortunately, The Big Short spends most of its running time trying to occupy a moral high ground none of its characters have earned. It’s true that none of the characters created the system that led to the housing crash, but none of them is remotely interested in fixing it, either. This is not a film about journalists or lawyers or a working-class single mother trying to expose the system and save people’s savings, jobs, or homes. It’s about a few guys who spotted a flaw in the system and used it to make a lot of money. Don’t get me wrong: This is still a great idea for a movie. But it’s essentially a heist movie – a legal, complicated, financial heist. Planning the caper, such as it is, occupies most of the first half, and it’s a fun ride, with snappy dialogue, cool performances, and a boatload of exposition delivered so stylishly you never feel bludgeoned by it. But as the film moves closer and closer to its conclusion – the real-life one we all know – it is gradually overwhelmed by blunt moralizing. For such a complicated subject, director Adam McKay draws a lot of clear lines dividing the good guys from the bad guys. The Good Guys are all furnished with sympathetic character traits and compelling motivation: Christian Bale’s Michael Burry is an oddball who tells the truth and hangs out in his office in gym clothes listening to thrash metal. Steve Carell’s Mark Baum is an abrasive loudmouth, but one who’s dedicated to uncovering The Truth and sticking it to big businesses who hurt the little guy. These characters are based on real people, so perhaps they really were decent people who took advantage of a system that was going to fail anyway. But The Big Short dumbs itself down tremendously when it comes to the people on the other side of the fence, those involved in the subprime mortgage system. These characters range from stupid to greedy to outright corrupt. And while we can’t deny that a lot of greed, stupidity, and corruption built the crisis, there were also a lot of people trying to provide for their families and buy into the American Dream. They may well have been greedy or stupid, but they probably had some other recognizable human characteristics as well. This approach might work better if the film had much interest in exploring the causes and the real movers and shakers of the housing market, but instead it focuses largely on the bottom rungs: Mortgage brokers, real estate agents, strippers… Late in the film, Baum meets with an investment manager who packages bad mortgages, but he’s more of an implement of exposition than a real character. The enemy of The Big Short is The System, which is made up of so many individuals making so many bad choices for so many reasons that no one is truly to blame. Which is true, in a way: There was no shadowy mastermind pulling the strings behind the scenes. But it reminds us that the protagonists don’t even have a windmill at which to tilt: There’s ultimately no cause other than profit. 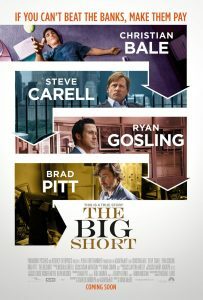 The Big Short tries so hard to position itself as a story of scrappy underdogs, and to a large extent, it is: The characters were, at the time, betting against a massively successful system that has prospered through decades of corruption and neglect. But the story is being told to an audience who knows how it all turned out, and knows who the bad guys really are. We all know, more or less, that subprime mortgages turned out to be precarious building blocks to an economy. The Big Short doesn’t have any interest in challenging our assumptions about why it happened; instead, it reinforces our conclusions about how everyone is greedy, stupid, or corrupt. At the end of the day, The Big Short is just like that credit analyst: It’s telling customers what they want to hear, reinforcing what we think we know. And for a film that spends so much time arguing against assumptions and institutions, it’s both wrong and hypocritical.